Available in 1/2lb and 1lb - same shape and size as the standard canvas throwing dummies. Simply place your feathers inside the strong elastic that is sewn in place around the Feather Dummy. 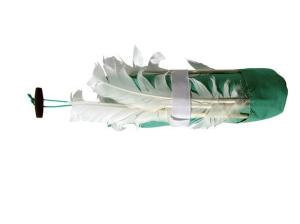 The Feather Dummy has a open pocket at the bottom to stop the feathers falling down. Feathers can be taken out at any time so you are left with a standard dummy to use as well!